We've been discussing Role Models this year. My personal role model is Dita Von Teese, not for her Burlesque talents, but for her inimitable style. We've also discussed Babe Paley and Adele. 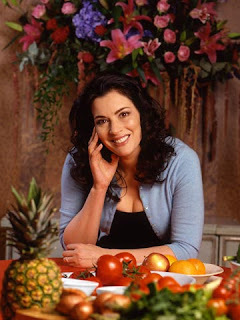 Last week, my friend Suzannah, asked me if I could do a post on Nigella Lawson. She feels that her body type most resembles Nigella's, and wanted some tips on being Nigella-ish. I was excited to hear this as Nigella is a well known Apple shaped celebrity, so she's a wonderful role model for we Apple shaped ladies. As we did with Adele, note at the top of my post, and here below, the transformation that Nigella has gone through since she achieved celebrity status. She's always been a very attractive woman, but as is the case for us all, she didn't really hit her stride until she had some professional guidance. I keep saying that the first step in looking your best is to know your body shape. 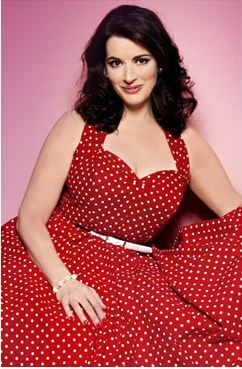 Above, you can see that earlier in her life, Nigella was focused on being 'fashionable' rather than 'stylishly dressed for body shape'. The pink ensemble in the first picture, although pretty, wasn't really doing that much for her in terms of flattering her shape, and her hair was sort of long and nondescript. A youthful look and pretty at the time, for sure. In the second pic, she's starting to find her inner glamour puss, and steps out a year or two later in some slenderising black with interesting neck detail. Nice. Then we see her in this fabulous red wiggle dress. Hair tumbling around her face in a profusion of soft curls, the sweetheart neckline drawing attention to her beautiful complexion and pretty features. Then back to basic black but with an eye to achieving a figure flattering look for a cold day. You see, looking great for your shape, isn't just about wearing figure flattering clothes. It's about being aware of how a simple hairstyle and touch of makeup draws attention to the features we want to accentuate, whilst playing down the ones we'd prefer ignored. 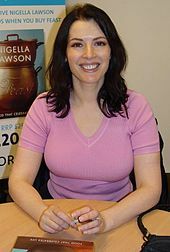 Above, we see Nigella at her first book signing, looking au naturel and very pretty for it. But here below, with a whisper of makeup, sparkly earrings, a more open neckline, and a flirtation with hot rollers on her locks, she's an absolute stunner. Honestly, any of us can do this. So now Nigellas discovered hot rollers and a neckline that draws attention to her lovely face and hair (and other assets! ), and she sets about using that knowledge to her advantage as often as possible. Here she is on the cover of one of her books. Open neckline which draws the eye to her face. Cardigan in a flattering colour creates a slenderising column centre front and covers wobbly upper arms. Tumbling locks, and a touch of feature enhancing makeup and she's the Nigella we all know and love. Again, below, the open neckline, a cute cropped cardi to create that all important slimming column-of-colour centre front, and soft curls. Now just to show how it can all still go dreadfully wrong, see here below, where Nigella has chosen a dress, that according to all the experts, should be an absolute winner for the Apple shaped woman. But this is a great example of how simple details make a difference. 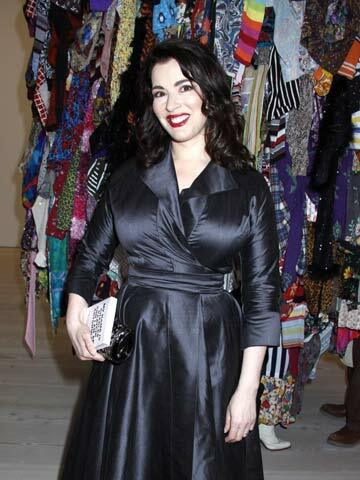 Nigella looks lovely here, BUT, the shiny fabric, and awkward cut on the neckline, do not do her justice. The shiny satin draws attention to her bustline and not much else. And not in a good way. In fact the dress looks so snug across the bust that it looks like it's the wrong size for her. And the black, just drains her in this dress. Imagine for a moment, that the neckline on this satin wrap dress was slightly more open, and that the fabric is velvet, not satin, navy blue not black. The effect would be entirely different and far lovelier, yes? You're our domestic goddess and looking just as good as Nigella. That is a lovely photo of you in the pink dress. Your efforts are being well and truly rewarded.